I have created several spreadsheets representing a dog's pedigree and statistics. What I would like to do now is be able to choose 2 dog's spreadsheets, and then copy and paste both of their pedigrees/data into a new spreadsheet to evaluate a test breeding between the 2 dogs. I No calculations are needed, I just need a way to create an organized and temporary way to present the data for both dogs. All the worksheets are identical in structure. The data is arranged in blocks. 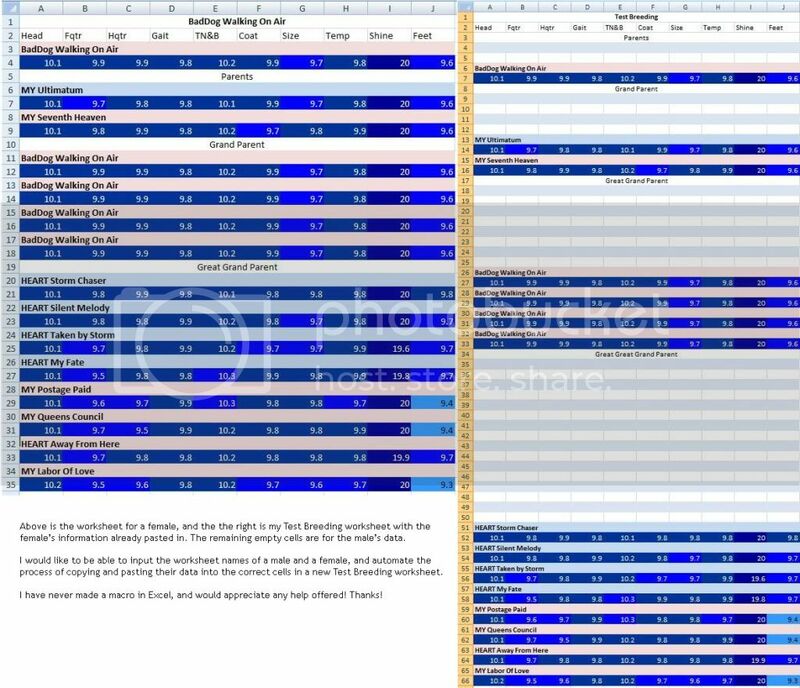 I know where I would like each block of data to be positioned on the new 'Test Breeding' worksheet. Unfortunately, I have no clue how to do this. Any assistance would be greatly appreciated! Keep in mind that we can't see your spreadsheets from where we're sitting, so it's kind of hard to give a specific answer. It sounds as if VLOOKUP would work, except the VLOOKUP doesn't work across multiple sheets. However, there is User Defined Function at the Ozgrid site that will do VLOOKUP's across all sheets in a workbook. As I said, not knowing the layout of your sheets, but using the fact that you said that all sheets are laid out the same, I'm thinking that you might be able to use this UDF to accomplish your task. Thanks for your reply. I was not able to get the code you suggested to work for me. It could be due to my limited knowledge of macroing in Excel. I am including a link to a snapshot and explanation along with this post to better express what I am wanting to accomplish.